Gary and Jan Bower are a writer and artist husband/wife team, but first and foremost they are parents and grandparents. Parents of twelve children, grandparents of nine, they live and homeschool in Michigin. 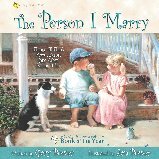 They are the author and illustrator of the award winning book, The Person I Marry. Set in a rhyming tone, this book focuses on the importance of looking beyong the glitter and glamour of the wedding in order to realize the importance of carefully choosing your spouse and keeping God in your marriage. I loved this book and the important message it represents. The paintings inside are beyond amazing and the text is fun to read. It is a real find at only $11.99 for a hardcover copy. Click here for ordering information. I received a digital copy of the book for this review, and I have to say that this made it hard to share fully with the children. We love to snuggle up and read together, but I am not about to haul my laptop onto my bed for reading time. Although the pictures were still gorgeous, I think having it in a digital format made it hard for my children to fully appreciate the beauty of the text and portraits. I am not sure they were able to internalize any of the message from the book. I like the story because there was a wedding with dances. I liked all the pictures and that the whole thing was a poem. I liked the pictures. I liked how they were all so different. The book didn't really make me think of anything else. I really liked it because it had a picture with somebody going on a tire swing and that's it. Oh wait, I have one more thing. Also because there was a picture of a bride and a bridegroom. In addition to this book, Bower Books has several other titles, all beautifully illustrated for $11.99 or less. I would say that this publishing company is a real find for a family, like mine, that strives to create a literature rich home. The paintings themselves offer children wonderful visual stimulation while the purity of the text nourishes their souls. Disclaimer: As a member of the TOS Homeschool Review group, I received a free copy of this product in exchange for an honest review on this blog. I received no other compensation. That is so neat! I plan to buy that book for my kids.